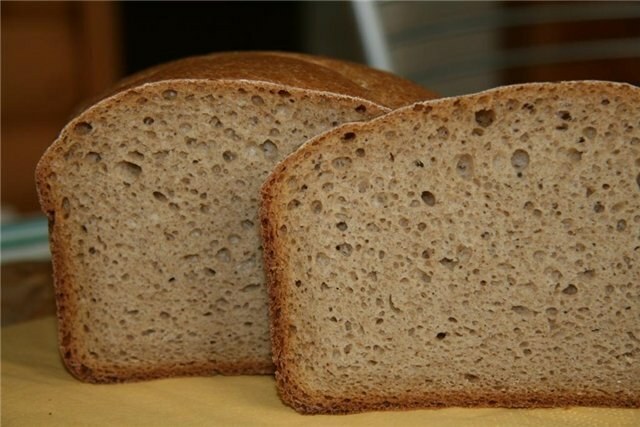 Rye bread, extremely tasty, you can prepare at home. It is better to use the method of batch on the yeast-free sourdough. In this case, the bread turns out not only tasty, but also useful. How to make yeast-free sourdough bread? On the first day of preparation of the leaven must be mixed with 70 g of rye flour and 100 ml warm water. It turns out the mass consistency of thick cream, which loosely cover with lid or towel and leave alone for 24 hours. Through the day, begin feeding the starter. Within 3 days her every day add 70 g rye flour and 100 ml warm water. Keep starter in a warm place. Already on the 5th day you can start baking bread. However, the leaven is still not Mature, so it is recommended to add in the first brew with dry yeast. Ready leaven, it is desirable to keep at temperature 10-12 ° C, adding a pinch of salt, which will prevent the souring of the product. Before kneading the starter needs a couple of hours to hold in heat. To the residue again add fertilizer. Thus, to bake rye bread almost every day. To bake rye bread to yeast free sourdough, you need the following ingredients: 200 g rye sourdough, 2.5 cups of rye flour, 80 ml of warm water, 140 ml welding of black tea, teaspoon salt, teaspoon sugar, butter for greasing forms. First of all, you need to prepare the dough. Yeast mixed with warm water and a Cup of sifted rye flour. The resulting dough cover with cling film and put them in a place, devoid of drafts, for 3.5-4 hours. The ideal temperature for the dough is 25-28oC. Make the yeast mixture in a deep container, as it increases in volume by 2.5 times. To the yeast mixture add the remaining flour, sugar, salt and tea leaves. Rye dough is very sticky, so knead it with wet hands is recommended. The dough will be formless, but do not add flour. In this case, the cakes will be too dense. The finished dough cover with cling film and leave to rest for 1.5 hours at a temperature of 30oC. When there is insufficient temperature the dough is to rise longer. Table moistened with water and put on it the dough has increased in size about 2-3 times. Shape a piece of wood that smooth with wet hands. Form for baking grease with butter and put in it the prepared dough. Now the dough should rasstoyatsya for 35-40 minutes. Submit the form in a pre-heated to 250oC, the oven to a moderate level. After about 10 minutes reduce the heat to 190-200oC. The bread needs to bake for at least 25-30 minutes. The willingness of the baking is determined by using wooden toothpicks. If the bread is easily pierced and the stick does not remain traces of raw dough, you can remove the cakes from the oven. Ready rye bread immediately get out of shape. The tip is moistened with a little water, to get beautiful shiny crust.